Pollia condensata fruits are one of the most striking examples of strong iridescent colouration in plants. The colour is caused by Bragg reflection of helicoidally stacked cellulose microfibrils that form multilayers in the cell walls of the epicarp. The bright blue colour of this fruit is more intense than that of many previously described biological materials. Uniquely in nature, the reflected colour differs from cell to cell, as the layer thicknesses in the multilayer stack vary, giving the fruit a striking pixelated or ’pointillist’ appearance. 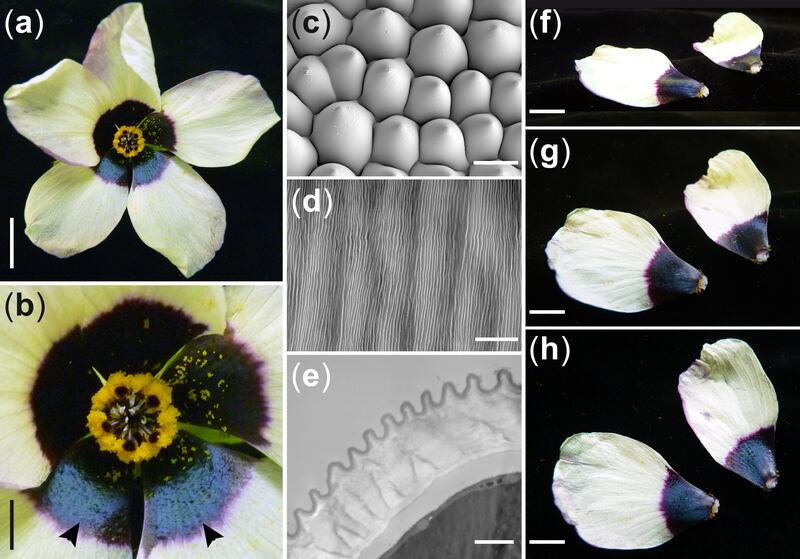 Flowers can produce iridescent colours via diffraction grating-like structures. In many flower species, the presence of surface striations in the epidermal layer gives rise to an angular colour variation. The iridescence on the petal of Hibiscus trionum can be captured by a camera in daylight illumination. The perianth shows a ‘bulls-eye’ pattern with a white distal region and a proximal purple area that surrounds the central reproductive organs (see (a) and (b)). The purple area is iridescent, as a metallic blue-green-gold sheen can be seen on this part of the petal (arrowheads). The yellow anthers have already shed some pollen onto the perianth. (c) The cells in the epidermis of the white region are conical with a smooth cuticle that does not produce any iridescence. (d) The epidermal cells in the purple region are flat and covered with a striated cuticle. (e) TEM analysis of the epidermis in the purple area of the petal reveals that the striations are part of the cuticle and constitute a diffraction grating that produces the iridescent effect. The average distance between the striations is 1.3 ` 0.3 lm. (f–h) Observation of H. trionum petals from three different angles (% 30°, 60° and 90°, respectively) shows the variation in hue, colour intensity and position on the purple surface as the observation angle varies. Bars: (a) 2 cm; (b, f–h) 1 cm; (c, d) 20 um; (e) 2 um. In addition to plants and animals, structural colour also appears in certain prokaryotes. An example of a structurally coloured bacteria strain is Flavobacterium Iridescent 1 (F. IR1). Individual bacteria in a colony of F. IR1 move around to organise themselves, using their bodies to create a larger structure. This way, the bacteria together construct a photonic crystal. Depending on the morphology of this photonic crystal, F. IR1 selectively reflects certain wavelengts of light. This results in a brightly coloured iridescent appearance of the colony. Genetic manipulation of structural color in bacterial colonies. Development of structural colour in leaf beetles. The flower of Hibiscus trionum is both visibly and measurably iridescent.